Designed with durability in mind. 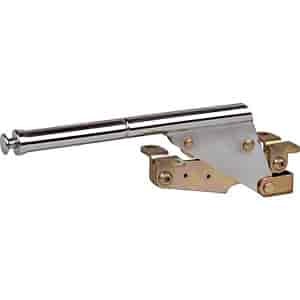 The Lokar Floor Mount Emergency Hand Brake is chromed steel and designed after the automotive industry standards. Ratchet cut gear plate and lock are heat treated for strength and safety. Special feature includes 4-point mounting capabilities for floor or side mounting. Comes complete with clevis for installation with Lokar Floor Mount Emergency Hand Brake Cables. Cables are sold separately. Hand brake measures 10-inches from end to end.